This book uses film and television as a resource for addressing the social and legal ills of the city. 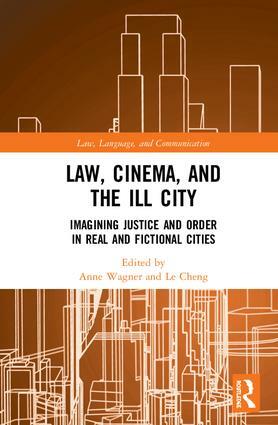 It presents a range of approaches to view the ill city through cinematic and televisual characterization in urban frameworks, political contexts, and cultural settings. Each chapter deconstructs the meaning of urban space as public space while critically generating a focus on order and justice, exploring issues such as state disorder, lawlessness, and revenge. The approach presents a careful balance between theory and application. The original and novel ideas presented in this book will be essential reading for those interested in the presentation of law and place in cultural texts such as film. One can imagine cities in a great many ways. One of those is to imagine them, as has been done in academia as well as in popular culture, as living organisms. But if cities are organisms, or bodies, they can of course be 'healthy' or 'ill', and questions then arise as to who, or what, in city life, constitutes 'healthy' sustenance, and who, or what is the viral agent of sickness. Or who, or what, constitutes the cure? Which is the Law, and Order, of urban sickness? Which is the Law, and Order, of urban health? And who, or what, decides all this? And what is the role of the visual, or the eye, in such decisions? The editors of and contributors to this volume have been exploring and illustrating these and related questions in a marvelous series of studies of how 'the urban', with all its woes and hopes, all its 'sickness' and 'health', all its law and order, is depicted in film and cinema. This volume is a significant contribution to the 'law and film' literature and should be on the bookshelf of students and scholars in fields such as film studies, legal semiotics, and visual culture. Le Cheng is a concurrent professor at the School of International Studies and Guanghua Law School, Zhejiang University. He now serves as Vice Dean of the School of International Studies, Dean of Institute of Cross-Cultural and Regional Studies, Director of the Center for Legal Discourse and Translation, and Director of the Center for Contemporary Chinese Discourse Studies. He is Editor-in-Chief of the International Journal of Legal Discourse, Editor of the International Journal for the Semiotics of Law, and Associate Editor-in-Chief of the International Journal of Semiotics and Visual Rhetorics. He has published widely in heritage law, legal discourse and translation, and semiotics. Anne Wagner is Professor of Legal Semiotics and Research Professor at the Centre de Recherche Droits et Perspectives du Droit, équipe René Demogue, Lille University, France. She is Editor-in-Chief of the Journal for the Semiotics of Law, Series Editor of Law, Language and Communication and President of the International Roundtables for the Semiotics of Law. She has been awarded the National Research Grant. Her main research interests include semiotics, verbal and non-verbal sign system analyses, language and law, legal culture and heritage, legal translation, legal terminology, and legal discourse studies.